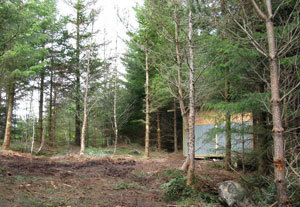 You are here: Home > Blog > Practical Guides > What do woodland owners do about sheds for storage ? Some people who manage their own woodlands feel it would be easier if they had a shed or building to store things and to shelter when it rains. In principle, local authorities are positive about this as they want to see woodlands managed but in practice planning officers often fear that sheds are the thin end of a wedge that will end up with a residential development which doesn't fit within the local development plan. Consequently there is a tension here but there is also a strong desire amongst planners and neighbours that sheds or shelters shoudld be unobtrusive. Sheds can be made or bought. As an experiment we have recently built one in a woodland that particularly needed shelter: the materials cost £800 but is large and very solidly built. The picture here illustrates how the positioning of such a shed can make it unobtrusive. An easier way to get a shed is to buy one "off the self" in a flatpacked form and many firms offer these at very reasonable prices - one that we know well is www.sheds.co.uk. An alternative is to use a shipping container which is usually very secure but these do need to be painted, carefully sited and ideally have plants growing over them. Please tell us (using the comments form below) what you have done (or plan to do) about a shed for shelter and tools. This interesting topic of discussion completely ignores the legal facts. What you are discussing here is amenity land (i.e. small pieces of land that happen to have trees on them and are usually split off from lsrger units by organisations or owners in the hope of making money whilst still controling their use by the instigation of “covenants” – something that should always be rejected. Real Woodlands are something completely different – “Occupational Woodlands” managed for commercial purposes for ANY forestry purpose (i.e. logging, logs, pole and charcoal making) are completely outside the scope of the Local Authorities and Local Authority planning permissions. They are controlled solely by acts of parliament which guarantees the right of owners to build any structure needed for the commercial production from the woodlands including a house (if this is essential for the housing of a full time person employed in production). Furthermore ANY income from commercial forestry production in any manner is completely tax free. The Local Authorities have no say in the matter and any attempt by them to interfere should be rejected and they should be advised to re-read the laws ! Most people reading these articles however are, at best “hobby woodland owners” – the “woodland” they think they own is not actually “Woodland” within the meaning of the law but “Amenity Land. So far as I know, the 28-day change-of-use rule would apply to temporary bushcraft-type living, with or without tents, etc. That’s not necessarily 28 days in a row, but a total of 28 days in a year. So far as I know, building below ground would be no easier to get approved than above ground, and there would be additional engineering problems. It’s permissible to bury a dead person on private ground so long as certain environmental constraints are met. You have to get a burial authorization form from the Registrar. However, the planners might have something to say about this as well. Being buried in a wood could cause difficulties for your descendants, if they chose to sell it. Another thought, can you have a building below ground, I’m not thinking nuclear fallout shelter, just security and aesthetics. I would love to own some woodland. At the moment I cannot afford it (and may never be able too), but unlike some of the morons, do not resent those that can. In this day and age, being able to get away from the plethora of technology crazed people would be fantastic (says the man on his PC). I have 2 dogs and I understand the dog dirt problem as it is on a grand scale in public areas. I have 2 grown children, one of which does medieval re-enactment and is also interested in some woodland. Does anybody know if it is possible to use woodland for temporary living in the old style, i.e. setting up a medieval camp for a week or 2? I also would like to go off grid for a period every year, but I presume this is not allowed as you would be living? If I can’t LIVE there can I die there? Really, can I be buried in my OWN woodland? Just a quick comment regarding secure tool/shelter building. My friend put a strong steel container on there woodland and on the outside covered it/ camouflaged it to look like a green/brown timber tree/bark/shiplap blending in cabin. Anyone trying to get in would get a shock as behind the quaint wooden door was a steel one. ha.2everyone happy….accept the thieves! If you are positive you want to get this land go for it, I have over 100 aces of woodland now and I always prosecute trespass along side criminal damage which is not a civil offence but Criminal and will leave the offenders with a record, affecting the car insurance, home insurance, any visit visas, mortgages, bank accounts, so on. we are the land owners not the criminals don’t let the parasites win and spoil you family dream which you have worked very hared for. I am considering buying 3 acres in the near future for conservation purposes and plan to construct a wood shed in a hidden-away place and will stay the night. The purpose of my venture is to keep people away from this piece of land because people and their dogs and their litter and their kids and their noise are the biggest enemy to the countryside. I want to give back a piece of land as a haven for wildlife, plants, flowers and trees. I will camp there with my own children for some splendid isolation, so that they can experience an alternative way of living – and I would have paid for the privilege to do so. I admire landowners who do the same as if it weren’t for them our countryside would be wrecked. I’m not able to enjoy any peace and quiet where I live by the Thames because people are hell bent on letting their pets run free to cause a menace and ride bikes dangerously along footpaths – all contributing to the hustle and bustle of what should be a tranquil place. I empathise with the people who obviously care about our natural planet and feel the way I do, but what can be done? With the population growing there are huge issues surrounding space and soon there will be nowhere to go where you can get back to nature without sitting next to a Macdonalds wrapper and listen to people talking on mobile phones in a place of beauty or picnicking with music playing. Woodland owners are doing a service to nature by keeping it away from human beings who – on the whole – don’t respect peace and quiet enough. I’m sure the wildlife would be happy to put up with my small wood cabin within my 3 acres for that. I’m doing it for nature, me and my kids – not the public! They, on the whole, don’t deserve it in my view. It is a great pity that the fundamental problem facing all of us is never addressed; overcrowding. Overcrowding is the reason why every small detail of our lives is controlled. When we live in such densely populated communities on a small overcrowded island the actions of each individual impacts on a greater number of people than it ever did in times past and so central government, local authorities and countless other agencies must micro-manage all aspects of our lives to avoid the mayhem that would otherwise arise. Still, beneath that thin veneer of control; stress, jealousy and hatred’ fuels a desire to destroy all that is perceived as beneficial to a ‘privileged minority’. In short; society has developed a ‘hive mentality’. For those of us who value privacy and a simpler way of life, investing our hard earned savings in buying a small woodland might seem a way, (at least for a short period of our lives), to escape the stresses of the ‘madding crowd’ but, not so. Ownership has no meaning in the hive mentality and at best we can only be paying custodians of our woods which can at any time taken from us for the good of the hive. In short; the dull headache you had whilst scrimping and saving to realize a dream pales into insignificance when you find yourself confronted with the throbbing migraine that results from trying to protect that dream. Nevertheless, we persevere and buy a wood and this is about sheds in woods, for storage isn’t it? If your motives are genuinely concerned with a real need to store tools and equipment securely in your own wood then why should the local authority object? Perhaps if your proposed construction is a bit extreme for its claimed use and has a certain, ‘Centre Parcs’, look about it;(some of the so-called shed manufactures produce sheds that have a distinctly glamorous look about them), the local authority may well be justified in being suspicious and objecting. We all know, or certainly should know, the rules pertaining to woodland before we buy so there is no point in complaining if you’re later caught trying to break those rules. 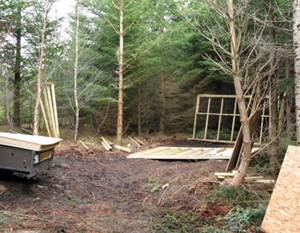 As for other woodland activities; Woodlands.co.uk ask purchasers to enter into a covenant designed to protect both woodland and owners from any activity that may cause a nuisance to the public or adjacent owners. I see nothing objectionable in this, though some of the wording is a little wooly, and it is certainly better to know that adjacent owners are of a similar mind-set before buying and finding yourself next to a motocross circuit. To those of the ‘by the people for the people’ set I say this: I live in an estate bordering on a zillion acres of wooded common land yet I have bought a modest 2.75 acre wood. Why? Because the zillion acres of common woodland is is full of fly-tips, stolen wrecked motor cycles, dog feces, broken glass and countess other forms of human detritus. It is also impossible to walk for more than a few minutes without having to dodge an illegal motorcycle ridden at breakneck speed along the trails. No, ‘the people’ are not my kind of people so why should I not own my own private space? The simplest solution to this problem is to purchase a can of government surplus Camo paint from the MoD auctions. The other alternative is a large supply of Camo net, from the same source, to cover a shed of natural materials. A timber roof of cedar tiles would be weatherproof, and ideal for this purpose. The walls could be tiled with cedar too. Camo-paint, covered with Camo-net could finally have a wild bramble/ivy/etc. natural top coat. This should all be situate as far from public access/neighbours, as possible. That which they cannot see from their land, should not concern ’em. I would not bother applying for any form of legal permission, as this obviously switches on the entire forces at the disposal of MI5. They then have to prosecute for any possible reason, in order to justify their unlawful surveillance. Some interesting posts. However there’s some common themes amongst some that buying a wood (or land) for that matter can help you escape from the real world. No so. It’ll bring you face to face with it, you’ll have to deal with it, ideals are fine but land owned by the people for the people is an old doctrine that we’re still centuries away from. Sadly someone took offence to my woodland store…. Police and the Fire and Rescue Service are jointly investigating a suspicious fire that destroyed a wooden cabin in remote woodland close to Backbarrow last night. A passing motorist alerted the fire service and it is believed the fire started sometime before 9pm yesterday, Wednesday 30 January. It has completely destroyed the building which is described as being located in woodland close to Backbarrow on Hazelrigg Lane. The fire is estimated to have caused around £25,000 worth of damage. Police are investigating and are appealing to anyone who may have witnessed anything suspicious in this area yesterday, to please come forward and contact PC Jonathan Murray on 101. Information can be passed to police anonymously via Crimestoppers on 0800 555 111. In my view as long as you are not living in the caravan then you can put it on the land. First thing to think about it its security. Think about covering the windows with plywood sheets that hang on hooks and padlocked in place when the caravan is not in use. I did this on my boat when it was left unatended and saved me from smashed windows. I lived on my boat for a while so it was important to me. where is the woodlands? can you get a caravan on it? Tim: can they see it from outside of your land? If not then they have proved they have entered your land without your consent. and done so with the intention of gathering information (unauthorised surveillance). As someone said Fight fire with fire. I must first say I don’t own any woodland but I’m working hard and saving to buy some. I hope one day to buy my own woods as I run a Wilderness/Sniper school and at the moment I am paying someone to use their woods (which is sadly slowing down my saving). When I do get my own woods, I will not want everyone walking all over it and causing damage. One thing I teach is tracking, so I sure wouldn’t want every man and his dog leaving tracks everywhere. I agree that if someone came onto MY land and then made a complaint. I would ask them what they were doing on my Private land in the first place. I would ask them to provide proof of their complaint; if they had taken photos on my land then they would have also broken more laws other than just trespass/criminal damage. I would not hesitate taking them to court. The land owner who lets me use his woods has benefited from me as I (in return) helped him with a problem of fly tippers. I provided him with video and still photos for the tippers and their registration number that he was able to give to the police on more than one occasion. I have also (with the owner consent) challenged people who I have seen on his land damaging his trees. Can anyone recommend a good solicitor who is experienced in these matters, for some advice. I’m currently having major issues with my small, modest, built from local wood tool store from neighbors that seem to have a lot of jealousy, free time and a direct line to the planning office.